Here we present a protocol that generates large amounts of murine monocytes from heterogeneous bone marrow for translational applications. In comparison to others, this new method helps reduce the number of sacrificed animals and lowers costs by avoiding expensive methods such as high gradient magnetic cell separation (MACS). Wagner, M., Koester, H., Deffge, C., Weinert, S., Lauf, J., Francke, A., Lee, J., Braun- Dullaeus, R. C., Herold, J. Isolation and Intravenous Injection of Murine Bone Marrow Derived Monocytes. J. Vis. Exp. (94), e52347, doi:10.3791/52347 (2014). As a subtype of leukocytes and progenitors of macrophages, monocytes are involved in many important processes of organisms and are often the subject of various fields in biomedical science. The method described below is a simple and effective way to isolate murine monocytes from heterogeneous bone marrow. Bone marrow from the femur and tibia of Balb/c mice is harvested by flushing with phosphate buffered saline (PBS). Cell suspension is supplemented with macrophage-colony stimulating factor (M-CSF) and cultured on ultra-low attachment surfaces to avoid adhesion-triggered differentiation of monocytes. The properties and differentiation of monocytes are characterized at various intervals. Fluorescence activated cell sorting (FACS), with markers like CD11b, CD115, and F4/80, is used for phenotyping. At the end of cultivation, the suspension consists of 45%± 12% monocytes. By removing adhesive macrophages, the purity can be raised up to 86%± 6%. After the isolation, monocytes can be utilized in various ways, and one of the most effective and common methods for in vivo delivery is intravenous tail vein injection. This technique of isolation and application is important for mouse model studies, especially in the fields of inflammation or immunology. Monocytes can also be used therapeutically in mouse disease models. The isolation of monocytes is important and critical for many in vitro and in vivo studies. These cells are targets for diseases such as peripheral arterial disease, coronary heart disease, or other ischemic diseases, since collateral vessel growth is strongly driven by local inflammation. Inflammatory responses include endothelial activation and local recruitment of leukocytes, mainly monocytes, which then mature to macrophages and create a highly arteriogenic environment by secreting multiple growth factors to induce the remodeling of an arteriole into a functional collateral artery1-3. Monocytes also mature to dendritic cells, which are frequently used for immunological studies4,5 and cancer research6,7. Problematic in the approach for monocyte isolation from peripheral blood8 is the high number of donor animals needed to produce a sufficient amount of monocytes for most analyses. Former protocols describe methods such as density gradient centrifugation and cell depletion via MACS9 when isolating monocytes; however, these techniques can alter the characteristics and functionality of monocytes which can lead to difficulties in interpretation10,11. Moreover, these methods are difficult and can reduce experimental reproducibility. Our aim with this protocol is to provide a simple and cost effective method to generate large amounts of bone marrow-derived monocytes. Due to the high cell yield of 11 x 106 ± 3 x 106 cells obtained by this protocol, we can substantially reduce the number of mice required during the isolation of bone marrow-derived monocytes. 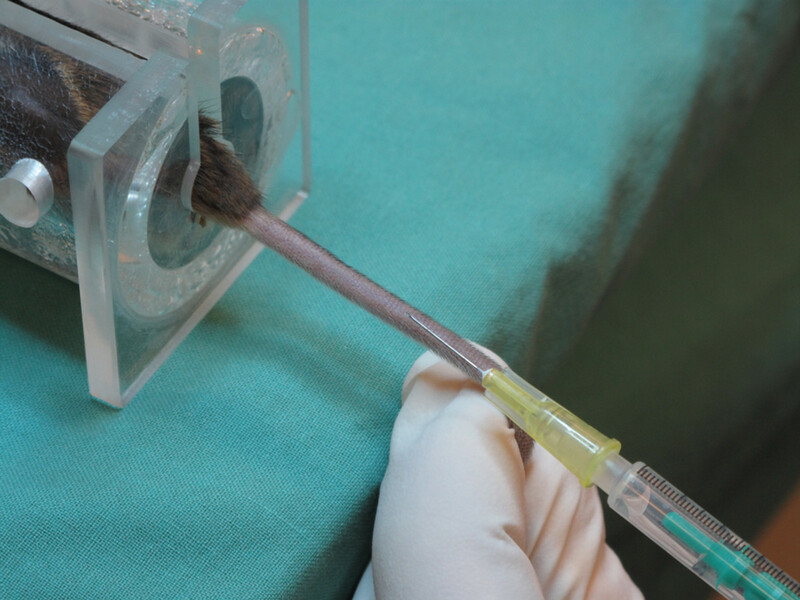 The procedure can be completed within a minimal amount of time, and without using expensive and complicated techniques as referenced above. Here, we extract monocytes from native bone marrow suspension of donor mice, cultivate the suspension on ultralow attachment plates, and supplement the solution with 20 ng/ml M-CFS. On day 5 of incubation, cells are harvested and characterized to confirm functional and phenotypic properties. For experiments in the field of arteriogenesis, intravenous transplantation of these bone marrow-derived monocytes into mice is an effective method of systemic drug delivery, which can be combined with femoral artery ligation in common peripheral arterial disease models. This study was performed with permission of the State of Saxony and Saxony-Anhalt, Regierungspraesidium Dresden/Halle, according to Section 8 of the German Law for animal protection (24D-9168.11-1/2008-24). Anesthetize the mouse using a 5% isoflurane concentration by vaporizing isoflurane in a closed bin. After the mouse has stopped moving for 3 sec, perform the cervical dislocation. Disinfect the hind limbs with ethanol (96%). Remove skin and muscles and separate the bones with a sterile scalpel. Start with an inguinal skin incision, and extend the incision toward the medial malleolus and perform a circular dissection of the skin around the lower calf. Remove the skin of the legs completely by peeling it proximally. Detach the quadriceps muscle from the femur with a sharp scalpel, remove both the anterior peroneus and the gastrocnemius muscle groups and disarticulate the leg at the hip joint by locating and dissecting the ligaments. Start anteriorly and proceed around the joint by carefully rotating the leg and transecting the ligaments, thereby disarticulating the joint. Wash femur and tibia with 96% ethanol for a minimum of 90 sec to guarantee aseptic cell preparation. Continue the washing process with sterile PBS to rinse off remaining ethanol. Note: All subsequent steps must be sterile to avoid contamination. Cut the proximal and distal end of each bone with a pair of fine scissors to gain access to the femoral and tibial shafts. Be careful with this step, since these bones break very easily. Flush the bones with warm medium (M199 + 10% fetal calf serum (FCS), + 1% Penicillin/Streptomycin). Use a sterile 28-G needle, a 1 ml syringe, and between 10-15 ml medium per bone for rinsing. Hold the bone with a fine forceps and rinse one by one until it turns semi-translucent. Carefully apply pressure to the end of the syringe plunger in order to minimize cell stress. Filter the bone marrow through a 70 µm nylon web and gather the filtrate. To extract the maximum quantity of bone marrow, rinse repeatedly from the distal and proximal ends. Rinse the sieve with PBS and gather the filtrate. Carefully dislodge debris and cellular conglomerates by gentle stirring and pipetting. Centrifuge the cell suspension at 250 x g for 10 min at RT. Discard the supernatant and resuspend the cells with approximately 25 ml of medium. Repeat once. Seed the cells on 6-well ultra-low-attachment surface plates to prevent permanent adhesion to the bottom of the plate. Use a concentration of 106 cells per ml with up to 6 ml per well. Supplement the suspension with 20 ng/ml M-CSF to promote cell differentiation. Culture the cells for 5 days at 37 °C and 5% carbon dioxide and observe daily. Note: These steps should be performed on ice. Proceed with either 1.4.1 or 1.4.2 accordingly. At this point, harvest the entire culture, including differentiated macrophages that will adhere to the culture-plates, even if they are ultra-low-attachment surface plates. Harvest the entire culture by gentle pipetting and detaching with a solution of 4 °C PBS, 0.5% bovine serum albumin (BSA) and 2 mM EDTA. Repeat until the plates are clear of remaining adherent cells - confirm under a microscope if unsure. Alternatively, discard adherent macrophages by harvesting the supernatant with the cells in suspension, which predominantly contain monocytes. Harvest the non-adherent cells with a solution of EDTA-free PBS and 0.5% BSA. Do not apply too much force in order to avoid dislodging mildly adherent macrophages. Note: It is possible to deplete the cell suspension of CD117+ stem- and progenitor cells by the use of MACS. Use manufacturer protocols for this procedure. Harvest the cells according to either steps 1.4.1 or 1.4.2. Centrifuge the cells at 250 x g for 10 min at 4 °C and repeat this step again. Resuspend at least 250,000 cells in 300 µl of FACS buffer per probe. Transfer cell solution onto a 96-well-plate (30 µl per well). Remove the supernatant and add 25 µl of antibody to each well (use manufacturer dilution). Stain the cells with antibodies (following manufacturer protocols for cell phenotyping after steps 1.5.1-1.5.6. 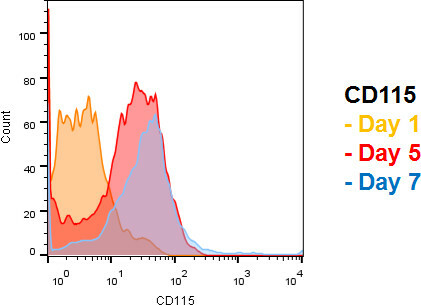 Commonly used markers for monocyte / macrophage identification include CD11b, F4/80 (Figure 3), CD115 (Figure 2), and Gr-1. Note: For a further description of cell solutions, the use of markers like CD4, CD8a, CD11c, CD25, CD45, CD45R, CD62L, CD80, CD86, CD145, CD117, MHCⅡ, Ly6C, Ly6G, and CD192 is recommended. Cellular characteristics were previously described12. Incubate the probes for 20 min at 4 °C. Centrifuge the probes at 250 x g for 5 min at 4 °C and resuspend with 200 µl of FACS buffer. Repeat this step twice. Transfer the probes into FACS tubes and perform the FACS analysis12. Perform FACS analysis12 on day 0, 3 and 5 to analyze cell differentiation. Warm the animals on a heating plate at 37 °C for about 10 min. Observe the animals while warming to recognize signs of overheating. Resuspend the monocytes, isolated in steps 1.1- 1.4, in 150 µl of NaCl, and load the cells into a 1 ml insulin syringe with a 30G needle. Lightly vortex the solution before loading the syringe to ensure all monocytes are injected. Always handle cells on ice to avoid heat-mediated attachment and activation of monocytes. Avoid disturbing other mice in the cage when choosing a mouse for intravenous injection. Note: Alternatively, use general anesthesia to guarantee stress free handling of the animals. Ensure that the mouse has space for breathing before closing the restrainer. Disinfect the injection site with disinfection agent. Spray on the tail of the mouse and let stand for at least 1 min. Stop venous blood flow of the tail by applying gentle pressure to the lateral tail side above the injection site, for better visibility of the veins. Inject at a 45 degree angle. Inject slowly and no more than 5 µl per g to avoid harming animals. If there is a blister, which is a sign of a failed injection, discontinue immediately and repeat the injection more proximally. Stop the bleeding at the injection side by applying gentle pressure for about 1 min. At the end of the procedure, open the retractor and place the mouse in its cage. Observe the mouse for 20 min to ensure that the animal was not harmed by the injection and sternal recumbency is maintained. Extend the time of observation until the mouse regains sufficient consciousness. Return the mouse to the company of other animals only after it has fully recovered. The cell solution extracted from the murine bone marrow consists of various cell types. The major cell types are lymphocytes, granulocytes and monocytes. 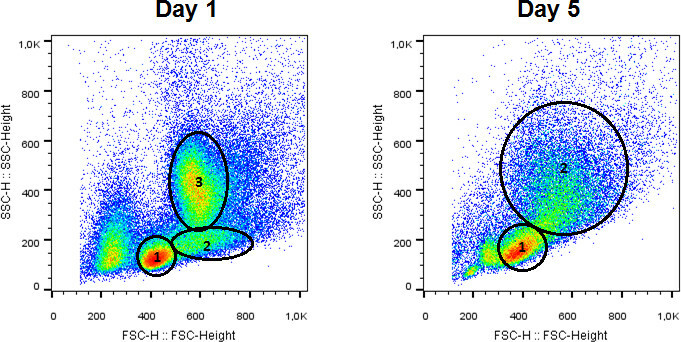 Cell types can be estimated by size and granularity, which is shown in Figure 1 for both native suspensions and cells harvested after 5 days of differentiation. Note the shifting cellular composition during cultivation. However, accurate classification of populations must rely on distinctive expression of cellular markers. The most important marker used to identify cells of the MPS-System is CD115, which functions as the M-CSF receptor and is specifically expressed on monocyte progenitors, monocytes and macrophages. Therefore, it might not be used to identify distinctive MPS-subsets, but can reliably estimate the absolute amount of cells driven into the monocyte/macrophage differentiation. 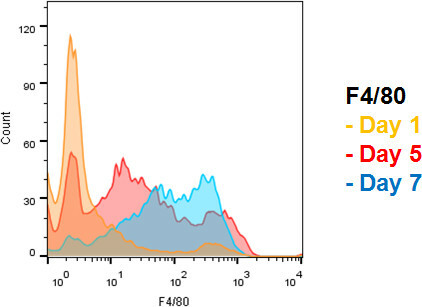 See Figure 2 for a timeline of CD115 expression during differentiation. The maturity marker F4/80 is useful to differentiate juvenile monocytes, mature monocytes, and macrophages. Macrophages show strong expression of F4/80 in comparison to juvenile monocyte progenitors, which are negative for the marker. 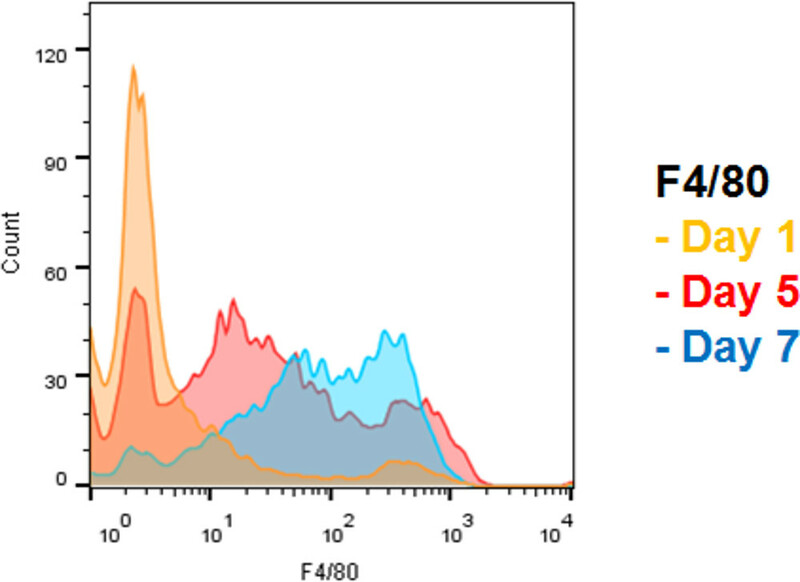 Mature monocytes show intermediate expression of F4/80. A combination of CD115 and F4/80 markers therefore represents a feasible method for quantifying and monitoring cell differentiation (see Figure 3). The combination of CD115 and F4/80 is sufficient for routine culture observation and quality control prior to application of cells. A more detailed examination of the bone-marrow-derived monocytes at day 5 of cultivation confirms their structural and functional properties in concordance to those of peripheral blood monocytes 12. It is important to fix the mouse carefully in the restrainer, avoiding tension on the tail. Restrict freedom of movement as much as possible without inhibiting breathing to facilitate the injection. Figure 1. Left panel: Composition of cell types at day 1 in culture. Cell types include lymphocytes, monocytes and granulocytes. Right panel: Note the shifting cellular composition during cultivation. Cell population includes monocytes and macrophages. Please click here to view a larger version of this figure. Figure 2. Timeline of CD115 expression during differentiation. Note that >95% of all cells are CD115 positive after 5 days of differentiation, indicating that the vast majority of cells are either monocytes or macrophages. Classification can be based on cell size and granularity, but specific cellular markers are more reliable. Please click here to view a larger version of this figure. Figure 3. Increasing expression of monocyte/macrophage maturity marker F4/80. Day 5: Note the appearance of a population with intermediate F4/80 expression, which is consistent with monocyte phenotype. Day 7: Note the right-shift of F4/80 expression, consistent with macrophage maturation. Please click here to view a larger version of this figure. Figure 4. Mouse fixed in restrainer for tail vein injection. After carefully restraining the mouse, rotate the tail 90 degrees until the veins are visible on the dorsal side. Please click here to view a larger version of this figure. Figure 5. Schematic cross section of the mouse tail. 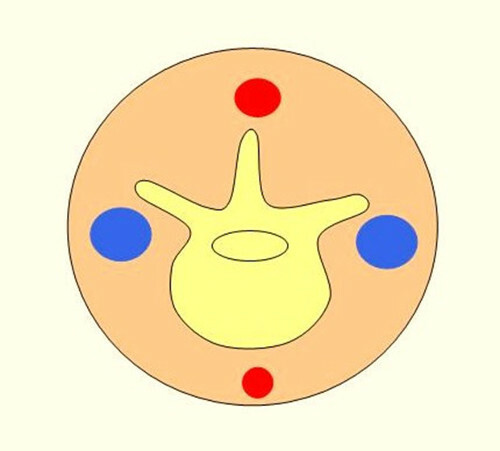 The picture illustrates the location of vessels within the mouse tail. The arteries (red) are located on the ventral and dorsal side, and the veins are on the lateral side of the tail. Please click here to view a larger version of this figure. We describe a simple and cost-effective method to isolate large amounts of murine monocytes from bone marrow. In comparison to other protocols using peripheral blood, which obtain monocyte yields5 of 1.4 x106, we are able to obtain higher yields of 11 x 106 ± 3 x 106 monocytes from a single donor mouse. When considering challenges with this method, it is important to mention the potential for contamination when working under non-sterile conditions. If rinsing and the following washing steps are not followed properly, contamination by bacteria and fungi is likely. Additionally, bone marrow consists of heterogeneous cell suspensions, including granulocytes, lymphocytes and erythroid cells. Normally these cells vanish between day 2 and 3 of cultivation due to the lack of growth factors. After growth factor driven differentiation, macrophages are the major source of contamination. To keep the number of macrophages low and to minimize the differentiation of monocytes to macrophages, the use of ultra-low attachment plates and the washing steps mentioned above are critical. It is difficult to identify a marker that is exclusively monocyte-specific. Interference between markers necessitates the use of more than one marker, and there is variability in the granularity and size of cells in analyzing cell suspensions. The markers and descriptions shown in Figures 1-3 are good alternatives for representative cell types in culture. It can be difficult to distinguish the various cell types, especially after day 5. Therefore it is critical to use other markers like CD115 and F4/80. Considering the expansion of bone marrow cells under adhesion-free conditions, macrophage differentiation can be prolonged and undifferentiated monocytes can accumulate. Macrophage differentiation indicates contamination; however, due to their adhesive nature even on ultra-low-attachment cultivation surfaces, they can be easily discarded while only harvesting non-adhesive cells from culture. In previous experiments1,3, contamination by macrophages has not led to serious clinical side effects. Histological workup of organs and muscles of mice after cell transplantation showed that injected macrophages assimilated in organs like spleen, liver or lung. The assimilation of macrophages in these organs demonstrated no observable clinical effects in mice. The molecular mechanism triggered by these macrophages can be interesting questions for further investigations. Monocytes as well as macrophages affect arteriogenesis in peripheral arterial disease, especially when applied systemically. Clinical side effects such as embolism or massive systemic inflammation could not be observed even after injection of more than 2.5 million monocytes, but these cells can trigger inflammation and potentially cause severe systemic effects. In human trials, these effects are likely to have clinical significance. The triggering of arteriogenesis can affect tumor growth or diabetic retinopathy, and such possible systemic effects of injected cell solutions should be explored in future studies. Previous publications9 describe differences between the characteristics of peripheral blood- and bone marrow-derived monocytes, which explain why the properties of monocytes from bone marrow can differ from those isolated from peripheral blood cells. The method of isolation is of clinical interest as well. Drawing blood instead of extracting human bone marrow is more practical in the context of clinical medicine. It is important to look after the welfare of the animals and to apply analgesia if needed. For intravenous injections, it is critical to practice handling both the animal and the syringe at the same time. If a single animal is undergoing multiple injections, the quality of the veins and the skin of the tail suffer. Despite these disadvantages, this method is very useful to study the behavior and characteristics of monocytes. Experiments in the field of atherosclerosis, immunology or inflammation can benefit from this method. Only 30 min are required from the extraction of bone marrow to the seeding of cells on 6-well ultra-low-attachment surface plates. Ethical concerns are minimized, because the high yield of this protocol minimizes the number of animals required as cell donors. This new method will be helpful for many studies involving monocytes. We have been focused on therapeutic augmentation of collateral vessel growth via transplantation of monocytes. The multifactorial nature of this process may explain why single factor approaches for augmentation of arteriogenesis have generated mixed results13,14 . This has led to the investigation of cell-based therapies. Autologous bone marrow-derived stem and progenitor cells have been identified as potential cells for transplantation, but only moderate clinical benefits have been reported15. Besides research on dosage, isolation methods, and administration routes, further research is still needed to determine the optimal cell type. A disadvantage of autologous cell transplantation could be their inability to activate the innate and/or adaptive immune response, and both are critical for arteriogenesis. Increasing local inflammation may represent the best stimulus for arteriogenesis16. Intravenous injection of monocytes is a common method for cell transplantation within mouse models if systemic drug delivery is desired. Because of systemic effects, side effects can occur as well. Ensure that the vein is targeted for injection. It is common to confuse arteries and veins, especially when injecting heavily pigmented mice. Arterial injection can cause emboli, which lead to systemic issues in circulation. This work was supported by the DFG (Deutsche Forschungsgemeinschaft, German Research Foundation) SFB 854 (Sonderforschungsbereich, collaborative research center). Thanks to Hans-Holger Gärtner, Audiovisuelles Medienzentrum, Otto-von-Guericke University Magdeburg, Magdeburg, Germany, for technical support. Herold, J., et al. Transplantation of monocytes: a novel strategy for in vivo augmentation of collateral vessel growth. Hum Gene Ther. 15, (1), 1-12 (2004). Herold, J., Tillmanns, H., Xing, Z., Strasser, R. H., Braun-Dullaeus, R. C. Isolation and transduction of monocytes: promising vehicles for therapeutic arteriogenesis. Langenbecks Arch Surg. 391, (2), 72-82 (2006). Francke, A., Weinert, S., Strasser, R. H., Braun-Dullaeus, R. C., Herold, J. Transplantation of bone marrow derived monocytes: a novel approach for augmentation of arteriogenesis in a murine model of femoral artery ligation. American Journal Of Translational Research. 5, (2), 155-169 (2013). Leon, B., et al. Dendritic cell differentiation potential of mouse monocytes: monocytes represent immediate precursors of CD8- and CD8+ splenic dendritic cells. Blood. 103, (7), 2668-2676 (2004). Timmerman, J. M., Levy, R. Dendritic cell vaccines for cancer immunotherapy. Annu Rev Med. 50, 507-529 (1999). Salem, M. L. The use of dendritic cells for Peptide-based vaccination in cancer immunotherapy. Methods Mol Biol. 1139, 479-503 (2014). Timmerman, J. M., et al. Idiotype-pulsed dendritic cell vaccination for B-cell lymphoma: clinical and immune responses in 35 patients. Blood. 99, (5), 1517-1526 (2002). Berthold, F. Isolation of human monocytes by Ficoll density gradient centrifugation. Blut. 43, (6), 367-371 (1981). Houthuys, E., Movahedi, K., De Baetselier, P., Van Ginderachter, J. A., Brouckaert, P. A method for the isolation and purification of mouse peripheral blood monocytes. Journal Of Immunological Methods. 359, (1-2), 1-10 (2010). Seeger, F. H., Tonn, T., Krzossok, N., Zeiher, A. M., Dimmeler, S. Cell isolation procedures matter: a comparison of different isolation protocols of bone marrow mononuclear cells used for cell therapy in patients with acute myocardial infarction. European Heart Journal. 28, (6), 766-772 (2007). Auffray, C., et al. CX3CR1+ CD115+ CD135+ common macrophage/DC precursors and the role of CX3CR1 in their response to inflammation. The Journal Of Experimental Medicine. 206, (3), 595-606 (2009). Francke, A., Herold, J., Weinert, S., Strasser, R. H., Braun-Dullaeus, R. C. Generation of mature murine monocytes from heterogeneous bone marrow and description of their properties. J. Histochem. Cytochem. 59, (9), 813-825 (2011). Sneider, E. B., Nowicki, P. T., Messina, L. M. Regenerative medicine in the treatment of peripheral arterial disease. Journal Of Cellular Biochemistry. 108, (4), 753-761 (2009). Van Royen, N., Piek, J. J., Schaper, W., Fulton, W. F. A critical review of clinical arteriogenesis research. J Am Coll Cardiol. 55, (1), 17-25 (2009). Lawall, H., Bramlage, P., Amann, B. Treatment of peripheral arterial disease using stem and progenitor cell therapy. J Vasc Surg. 53, (2), 445-453 (2011). Herold, J., et al. Tetanus toxoid-pulsed monocyte vaccination for augmentation of collateral vessel growth. Journal of the American Heart Association. 3, (2), e000611 (2014).